This is a quick one. 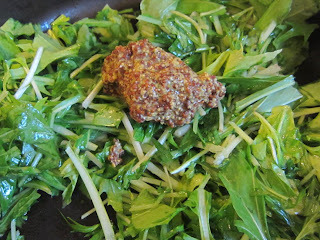 Barely a recipe, and more like what happened to my mustard greens. I have a confession to make... I cook all my greens the same way. I use greens in lots of dishes, anywhere they'll fit, but if I'm just making up a bunch of greens, it's garlic, a bit of vinegar, and if we're feeling luxurious, some bacon. But that's the routine, always. And it's mustard green time. Yay for new veg. I got some mustard greens (this one is Mizuna, from the unGoogleable Silver Mine Farm) and I had already made salad of another variety and thought it was time to get cooking. But as much as I love garlic and vinegar on greens, it was time for a change. 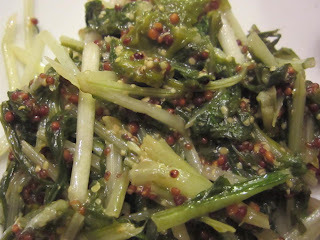 You know what mustard greens go well with? It's so obvious. Mustard. These aren't as tough as collards or kale but they're not nearly as wimpy as spinach and they can take a little texture. Plus, they already have that lightly peppery thing going for them. Let's play that up. Four ingredients, happy side dish. 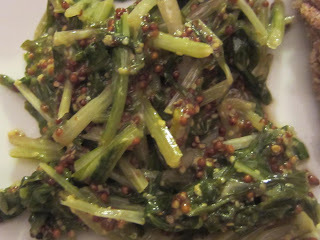 I started with six ounces of mustard greens, (stems and all with the Mizuna). This recipe, like everything else, is infinitely scalable, so adjust to your own greens. Into a saute pan with a teaspoon of oil. I use olive, but use what you like. 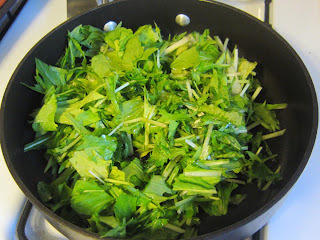 Heat to medium, stir and flip occasionally until the greens start to wilt. The photo doesn't quite depict how wilted these greens were. They were yielding to a spatula and heading towards soft. I added a tablespoon of very grainy mustard. I don't think this is the place for yellow mustard. Stir that around, leaving the heat on, for maybe a total of 15 minutes cooking time. Then squirt with the juice of half a lemon, stir again, and serve. It's like that.